It’s now 2018, which means it’s taken me six years to get here! I’ve had so much fun and learned so much over the past several years, and couldn’t be more excited to be where I am today. But it has been quite a journey! 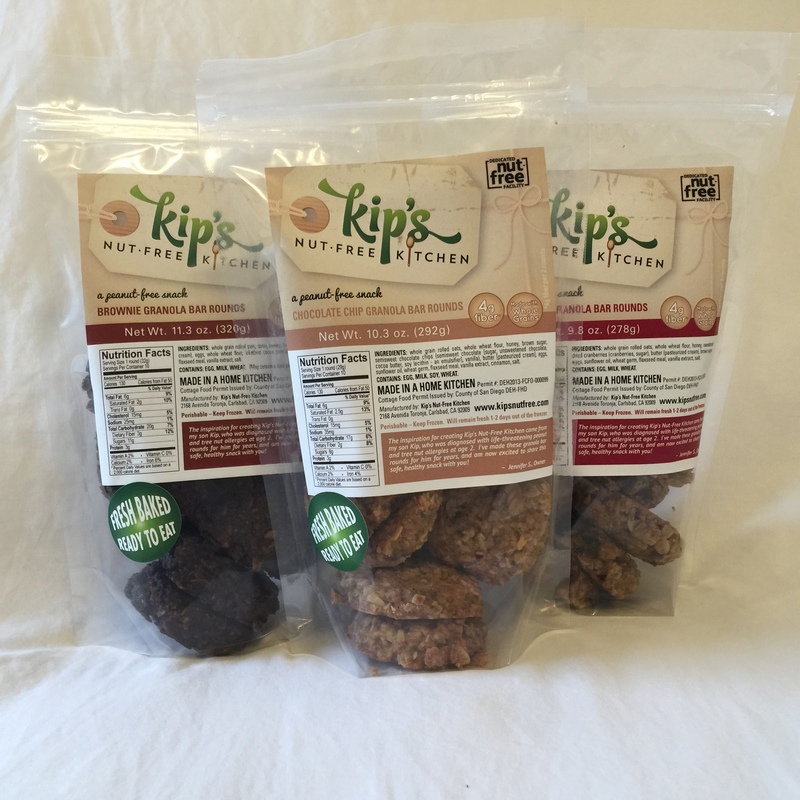 Back in 2011 I created Kip’s Nut-Free Kitchen with the dream of providing snacks and treats for people allergic to peanuts and tree nuts, like my son Kip. Since then, my business has been just more than a hobby. But now, in 2018, I’m ready to make this business be a full-time commitment. More about this later. Back to the beginning. When Kip was two, we found out he had severe food allergies. And like all food allergy parents, over time we became more and more frustrated that many foods that would have been healthy for Kip were not actually safe, because they were made on shared equipment with nuts or peanuts. One example was granola bars. 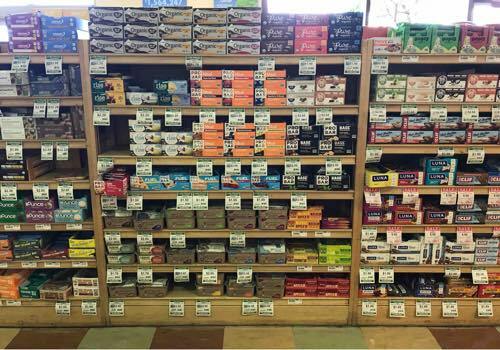 Imagine staring at that huge wall of granola bars in the grocery store, where only one option is safe for your child (or maybe not even that). So, I decided that this is what I would sell. There had to be so many people like Kip who wanted healthy snacks, but had few to no options. The bars I created were small and round (since I couldn’t figure out how to consistently make rectangular bars), so I called them “Granola Rounds”. I decided I would sell them baked, and frozen, so the inventory would last. But a huge roadblock stood in my way: I couldn’t find a commercial kitchen to rent anywhere that was free of peanuts and tree nuts. Every single kitchen for rent allowed all allergens. And that was a deal breaker for me. There was no way I could sell food that could come in contact with peanuts or tree nuts. I met with a bakery going out of business near me to consider leasing the space, but that was a risky investment for someone who had never sold her product (and never owned a bakery)! Where was I supposed to bake, and how could I sell? So I was stuck. I kept researching, meeting with people, asking lots of questions, and planning what my business would look like. At that time, although many states allowed home kitchens to be permitted, California did not. So I worked on getting my business ready in case an option opened up to be able to sell my Granola Rounds. I took a food safety course. Researched packaging. Waited. But then in 2013, something amazing happened. The Cottage Food law passed in California, which meant I could sell food made from home! It wouldn’t allow me to ship, but it was a start. I sold the Granola Rounds in stand-up-pouches, 10 per pouch. After selling direct for about a year, and still plotting how to grow my business, I decided to try grocery stores. I got my first account in August 2014. What an amazing feeling. I still remember the day! 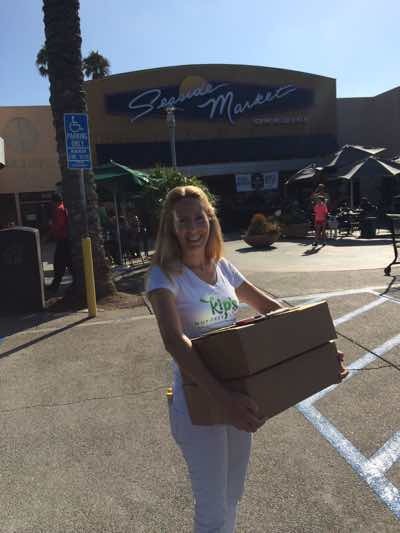 Here I am making my first delivery, to Cardiff Seaside Market in Cardiff-by-the-Sea, CA. (BTW, do you see the Epi Pens in my back pocket? They can’t ever stay in a warm car, so I always have them on me. A familiar sight to anyone living in the food allergy world). 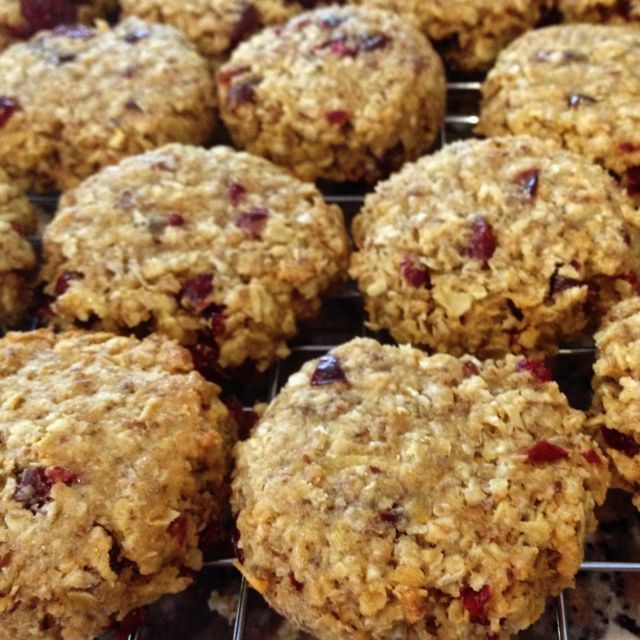 A few months later, after getting into a few more grocery stores, I created a gluten-free version of my chocolate chip Granola Round, bringing my total offerings to 4. I just kept getting requests for a GF product. It was now late 2014. I also changed packaging to a nice square deli container right around this time (which involved a label redesign), because my stand-up-pouches kept falling over on the freezer shelf. 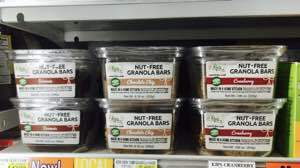 I also re-named my product to “Granola Bars” (yeah, yeah, I know they’re still round at this point, but customers weren’t connecting to the “Granola Round” concept). 1. I could not ship my products due to the restrictions of the Cottage Food law. 2. Even if I could ship, having a frozen product wouldn’t ship well or be cost effective. 3. I couldn’t make money making everything in small batches, by myself. I knew this wasn’t a financially sound business model, but I also knew it wasn’t my “end game”. I knew an opportunity for growth would eventually come along. And there were still so few options for food-allergic individuals on the market! I wasn’t going to give up my dream. All along, I had also been researching contract food manufacturers (“copackers”) that could produce my bars for me. But I could never find one that would work. 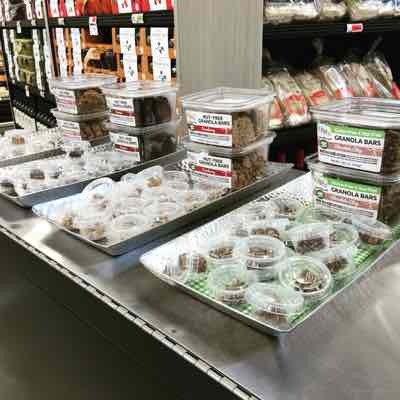 Every option I found was either a small nut free bakery that didn’t want to bake for others, or, a huge commercial kitchen that wasn’t free of nuts and peanuts (or was allergen free, but wouldn't work with startups). Although my limited options for growth were frustrating and seemed unending, I did still enjoy the day-to-day of being a Cottage Food Operation. I spent several hours each week baking in my kitchen, listening to audio books and my favorite music. (I did hire a few people over the years to help me bake or do my in-store demos, but it never lasted. I could only offer a few hours of work each week, which was never enough to retain an employee). Life was full for me, also having two young kids at home, and I was still pursuing my dream of making a difference in the food allergy world. Time went by quickly. I did grocery store demos every few weeks, where I not only experienced great personal growth by getting over my fear of sales, but I also got to connect with people and understand what they were looking for in a product. What did they like about my product, and what didn’t they like? Was it affordable? One common theme that kept popping up was that I would meet people who wanted to try the bars, and were excited that I was “allergy friendly”, but I wasn’t safe for THEIR allergies. My bars contained eggs, butter, and wheat (except the gluten-free flavor), so right off the bat, I couldn’t sell to people allergic to dairy, eggs, or wheat. It really began to frustrate me. My whole reason for starting Kip’s was to help people with food allergies, yet here were all of these people that I couldn’t help. An idea began to form. By now, it was early 2016. Business was picking up, and life was starting to get stressful. I could barely keep up with the baking, deliveries, and demos. I started having chronic hand pain from the repetitive motion of squeezing batter out of a hand-held ice cream scoop. I came to a conclusion (actually, I came to this conclusion many times over the years, but kept ignoring it): this wasn’t working. I couldn’t keep on this way. I knew this home business was not scalable, but until now the dream of something bigger kept me going. But I finally was at my breaking point. The more stores I got into, the more I had to bake, and the more stress I faced. I knew I was at a major crossroads. Do I stop completely? Or is there still a way for me to follow my dream of creating allergy-friendly food? (Meanwhile, I can’t believe my husband was still supportive of my business after over 4 years. I am very lucky. I think he just got used to the idea of having a single-income family). I decided to pull all of my bars off the shelves and stop baking. But I would take one more shot at this business. 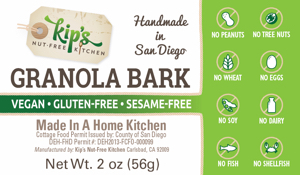 I was going to create a product that was free of ALL “top 8” food allergens. Not just nuts and peanuts. This way, I could reach almost anyone with a food allergy, and make more of an impact. And I told my husband I would give it “one more year” to see if it would work. I wasn’t going to end up in the same spot as before, baking all day and exhausted. 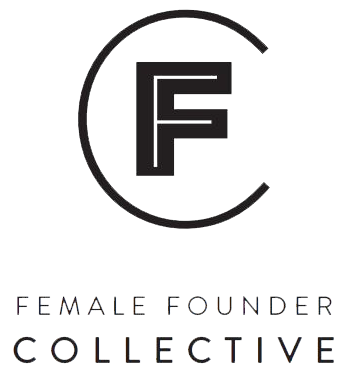 If I couldn’t find a way to significantly grow or change the business within a year, I would stop. (I do have to admit that I played this “one more year” card a few times in the past). So in the spring of 2016, I started playing around in the kitchen again. The result, which came in May 2016, was my Granola Bark. 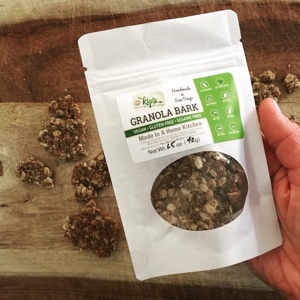 I decided on “bark” because I found it to be the perfect combination of granola cereal and a granola bar. It’s like a granola bar, but broken into pieces. You take only what you want. A small amount for kids, a larger amount for adults. It’s super crunchy and fun to eat. It’s not like granola, which is messy and really only conveniently eaten with a spoon. And it’s actually really versatile – you can crumble it onto salads or over smoothie bowls, you can soak it to create overnight oats, or you can dip it in chocolate as a fancy dessert! I decided to go back to my first grocery store again, to test how it would sell. But I didn’t try to get any other accounts. I was taking it slow this time, being more calculating in my approach. I still didn’t have a way to make it in large quantities or ship it, so I was just “testing the waters” to see what people thought. In May 2017 I decided I would finally try a Farmer’s Market, to gather more information about how people liked the bark, how best to market it, what size package people wanted, what price point worked, etc. I had been putting off Farmer’s Markets for years due to the difficulty of juggling young kids with the demanding schedule of not only spending every Sunday at the market, but spending the entire week baking to have inventory to sell. It took a lot of work to get the booth together and I was quite proud of myself for overcoming what I’d always seen as a huge hurdle. (I eventually learned to set up and breakdown the entire booth myself, although usually booth "neighbors" pitched in and all helped each other). 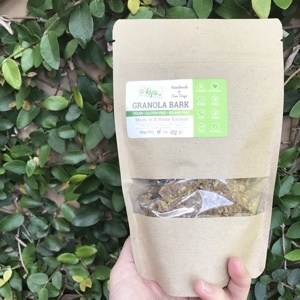 After 6 months at the Farmer’s Market and weekly demos at the grocery store, I felt I had some great feedback about my Granola Bark and how to go about introducing it to the world outside of San Diego. I was ready to take the leap and grow Kip’s Nut-Free Kitchen to the next level. 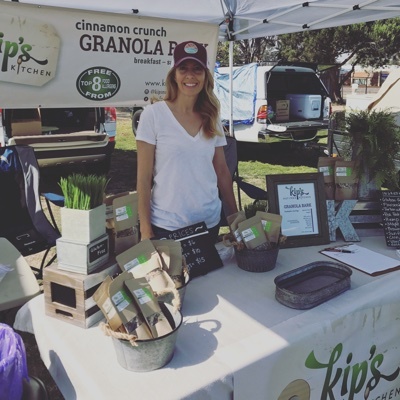 I pulled out of the Farmer’s Market in late 2017, so that instead of spending my entire week baking, I would create the structure for Kip’s to be produced commercially. I decided to take the plunge and hired an amazing design firm (Cowlick Appeal) to rebrand Kip’s Nut-Free Kitchen and turn it into Kip’s (which is the topic of my next blog post). My brand, website, and packaging needed a tune-up before I introduced it to the world, and I couldn’t be happier with the decision and the results. 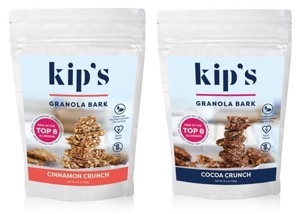 Now here we are in the summer of 2018, and Kip’s is finally ready to bring vegan, allergy-friendly snacks to the world. Even though I’ve been on this journey for over 6 years, I can’t believe this is actually happening and my dream is moving forward, as I’d always wanted. What will the future hold for me, and for Kip’s? 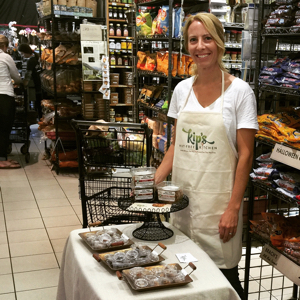 Hopefully more growth, and the chance to share Kip’s foods across the country. I know this next step is going to be like nothing I’ve ever experienced, as I’ll be facing new challenges that weren’t present as a Cottage Food business. But I’m so excited to move forward. I hope that my journey with Kip’s is really just beginning, and there are many more years to come, and stories to share.